As we approach the latter innings of the credit cycle, balancing the need for current growth with the risks that lie ahead is becoming the primary focus for many investors. Securitized credit has historically delivered higher yields than similarly rated corporate and municipal bonds. With floating rate instruments and embedded structural protections, securitized credit also has the potential to deliver attractive returns while providing the ballast portfolios need to weather future market turbulence. Despite these potential benefits, most investors remain significantly underexposed to securitized credit. A gradual increase in risk-free rates and an expected tightening of credit spreads creates the potential for range-bound yields in the growth seeking fixed income allocations of plan sponsor portfolios. Facing this challenge, we believe plan sponsors need to expand the potential investment opportunity set to lean against this persistent market headwind and improve risk-adjusted returns. However, expanding the search for attractive yield and total return potential in the latter innings of a credit cycle is especially difficult, as investors must balance the need for current growth with the risks that lie ahead. Against this backdrop, we believe the current yield potential, floating-rate instruments and structural protections of securitized credit are particularly valuable. Yet despite these potential benefits, many institutional investors remain underexposed to securitized credit, preferring other spread sectors like high yield, senior loans and emerging market debt for standalone allocations within their broader fixed income portfolios. However, as Figure 1 shows, a broadly diversified securitized credit approach has significantly outperformed other spread sectors during major credit events in the last six years. Source: Voya Investment Management, J.P Morgan and Bloomberg Barclays. 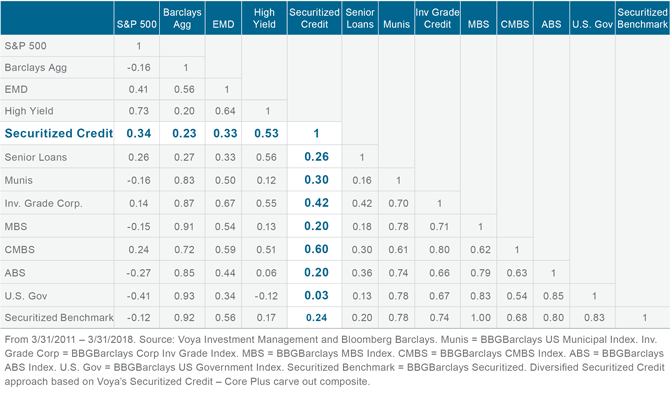 Diversified Securitized Credit approach based on Voya’s Securitized Credit – Core Plus carve out composite. High yield = Bloomberg Barclays U.S. Corporate High Yield. EMD = JPMorgan EMBI Plus Index. Senior loans = the S&P/LSTA Leveraged Loan Index. Past performance is no guarantee of future results. In addition to this relatively attractive historical downside protection, a broadly diversified securitized credit strategy has delivered historically low correlation to other fixed income sectors, as well as low correlation to the individual securitized sub-sectors (Figure 2). As the asset class continues its evolution into a significant component of the global economy, we believe it is time for investors to rethink how they use securitized credit in broader portfolio strategy. 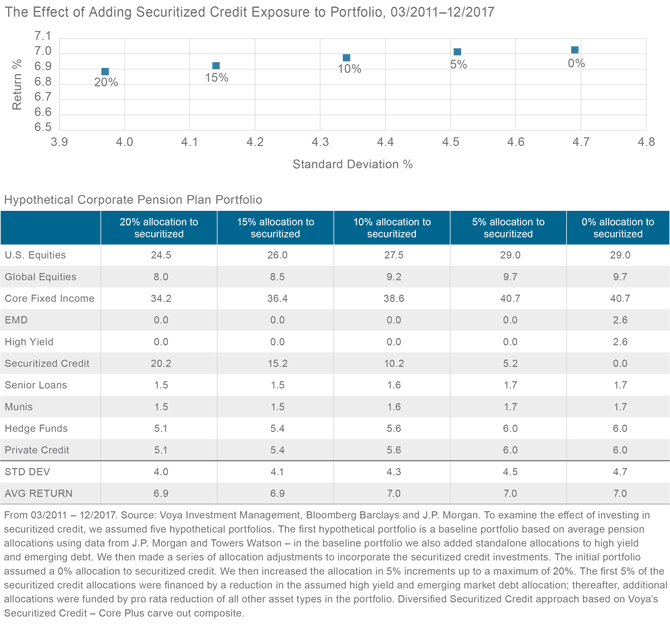 While securitized credit has become an increasingly important component of multi-sector strategies like core and core plus fixed income, standalone exposure to the asset class has not been broadly adopted by the investment and consultant community as it has with other spread sectors like EMD, high yield and senior loans. The small subset of investors who have embraced standalone securitized allocations have tended to favor the opportunistic niche strategies that emerged to capitalize on the extreme market dislocation created by the financial crisis. In the years that followed the financial crisis, each sub-sector of the securitized credit market significantly outperformed through the market recovery — where and what you invested in made little difference. This environment led to outsized returns for many of these opportunistic hedge funds. However, many of these alternative securitized strategies are concentrated in just one segment of the securitized market. When that niche opportunity ultimately becomes less attractive, these concentrated strategies looking to deploy cash could be driven down one of two paths – they can continue allocating to their original opportunity set albeit in a much less attractive environment or pivot into areas of the market where the manager lacks expertise. This is a potential scenario that could lead to unexpected outcomes and underperformance for investors who enjoyed such strong returns in past years. Perhaps most commonly, investors gain exposure to securitized fixed income via their core and core plus fixed income portfolios. However, the dominant securitized sector in most core and core plus strategies is agency residential mortgage-backed securities (RMBS), which accounts for more than a quarter of the Bloomberg Barclays U.S. Aggregate Index. Due to the nature of the agency guaranty in agency RMBS, there is minimal exposure to credit risk. As a result, interest-rate risk is the dominant driver of return for agency-backed residential mortgages. 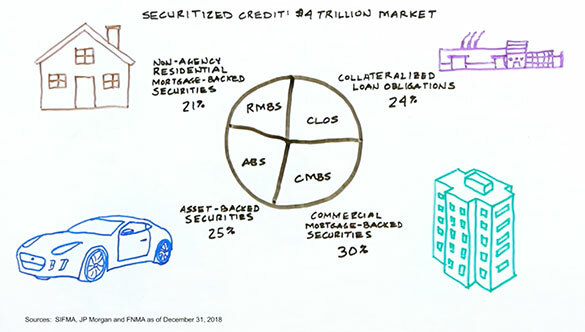 While it’s true that non-agency RMBS, commercial mortgage-backed securities (CMBS) and asset-backed securities (ABS) have become more common in core and core plus fixed income portfolios, the total amount allocated to these sectors is still small, leaving most investors underexposed to a market that has become a significant component of the global economy. Furthermore, transparency into the securitized credit risks taken by the multi-sector manager is likely to be lower than available in a dedicated strategy. Source: Voya Investment Management, SIFMA and Bloomberg. Market size represents outstanding balances as of 03/31/18. We believe common applications of securitized credit in portfolio strategy narrow the opportunity set too significantly or otherwise diminish its potential positive impact in the portfolio. For investors to fully benefit from the asset class on a sustained, through-the-cycle basis, transparent access to the broader opportunity set in securitized credit markets is necessary. Securitized markets have evolved to become an important part of the global economy. For example, securitized credit increases capital for lending, allowing institutions to access financing without increasing their liabilities, thereby expanding the capital available for loans. This in turn helps lower borrowing costs and makes loans available to more borrowers. In addition, structuring new securities collateralized by securitized asset pools increases the liquidity of previously illiquid asset types. As the securitization market has evolved, market participation has broadened, building the depth of liquidity across a growing range of asset types. As a result, securitized credit offers a diversified menu of exposures, from the residential housing market, U.S. consumer, the corporate credit cycle and commercial real estate market. Figure 3 highlights the major risk types available in the securitized credit market. In addition to these main categories, smaller sub-sectors of asset-backed securities exist, creating additional opportunities for diversification. Examples of these smaller sub-sectors include ABS backed by collateral pools of franchise and royalty agreements, auto loans, equipment lease agreements, wireless tower leases, billboard leases, aircraft lease and maintenance agreements, and shipping container lease agreements. Securitized investments also offer a spectrum of structural protections, yield profiles and coupon structures. The weighted average life of securitized credit investments also varies within and across subsectors, providing additional diversification benefits in a broader portfolio. As a result of these different risk types, a broad securitized credit allocation can provide diversification from other asset classes, and benefit from the robust diversification within the individual securitized sub-sectors. Securitized credit managers with the appropriate expertise across sub-sectors can tactically adjust allocations based on the most attractive opportunities and perceived relative value at any given time, which creates the potential for consistent outperformance as market conditions change during and through market cycles. 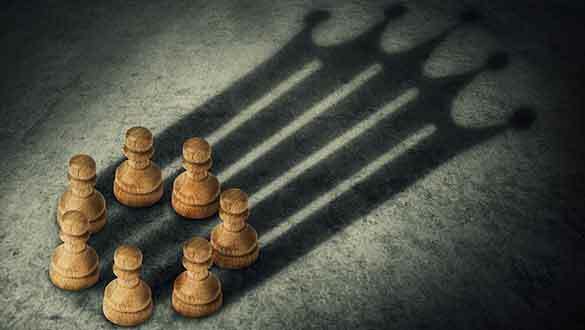 Portfolio Strategy: How Should Plan Sponsors Think About Securitized Credit Allocations? While certain sub-sectors of the securitized space like high quality collateralized mortgage obligations make sense to include in liability-hedging allocations, we believe broader standalone securitized allocations are more appropriate and effective in a plan sponsor’s return-seeking portfolio. To illustrate the potential benefits of a securitized allocation, consider a plan that has embraced standalone high yield and emerging market debt allocations. Earlier, we highlighted the outperformance of a broadly diversified securitized approach versus these spread sectors during specific credit events of the last six years. Further analysis of the recent market environment shows that replacing these allocations with securitized credit enhances the risk profile of the overall portfolio without materially affecting returns. Figure 4 uses a model corporate pension plan growth portfolio and charts the impact of adding securitized credit in 5% increments. Conclusion: What’s Next for Securitized Credit? The securitized credit market has grown to more than $2.5 trillion and has evolved to become an integral component of the global economy—yet most investors remain significantly underexposed to this growing and important asset class. It was not too long ago that most investors and consultants viewed bank loans as an esoteric asset class with limited applicability in broader portfolio strategy. With floating rate instruments and embedded structural protections, we believe securitized credit is poised to take off in a similar fashion. As consumers inevitably re-lever and mortgage credit availability potentially thaws, opportunities from higher net new supply may fall in place to help accommodate a truly transformative status for securitized markets. Given current spread levels for corporate credit and the impending turn in the credit cycle, we believe securitized credit provides even more attractive relative value in the current market environment. As demonstrated in recent periods of volatility, securitized credit has the potential to deliver attractive returns while providing the ballast portfolios need to weather future market turbulence across a wide range of economic scenarios. All investing involves risks of fluctuating prices and the uncertainties of rates of return and yield. Price volatility, liquidity and other risks accompany an investment in equity securities of foreign, smaller capitalized companies. International investing does pose special risks including currency fluctuation, economic and political risks not found in investments that are solely domestic. Risks of foreign investing are generally intensified for investments in emerging markets. Voya Investment Management has prepared this paper for informational purposes. Nothing contained herein should be construed as (i) an offer to sell or solicitation of an offer to buy any security or (ii) a recommendation as to the advisability of investing in, purchasing or selling any security. Any opinions expressed herein reflect our judgment and are subject to change. Certain of the statements contained herein are statements of future expectations and other forward-looking statements that are based on management’s current views and assumptions and involve known and unknown risks and uncertainties that could cause actual results, performance or events to differ materially from those expressed or implied in such statements. Actual results, performance or events may differ materially from those in such statements due to, without limitation, (1) general economic conditions, (2) performance of financial markets, (3) changes in laws and regulations, and (4) changes in the policies of governments and/or regulatory authorities. The opinions, views and information expressed in this commentary regarding holdings are subject to change without notice. The information provided regarding holdings is not a recommendation to buy or sell any security. Fund holdings are fluid and are subject to daily change based on market conditions and other factors. Investment related documents, such as prospectuses, may not be available to prospective investors in some jurisdictions where such investments are prohibited for sale. The opinions, views and information expressed in this presentation regarding holdings are subject to change without notice. The information provided regarding holdings is not a recommendation to buy or sell any security. 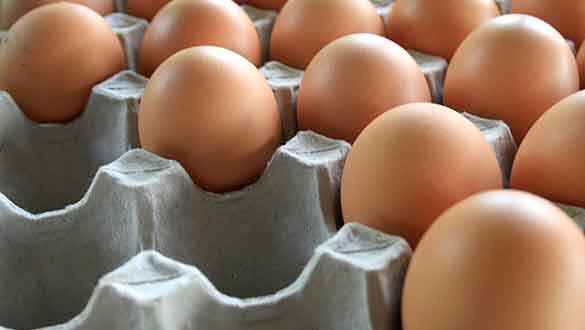 Portfolio holdings are fluid and are subject to daily change based on market conditions and other factors. Products and services are offered through Voya family of companies. Please visit us at http://voya.com for information regarding other products and services offered through Voya family of companies. Not all products are available in all states. For Australian Investors Voya Investment Management Co. LLC (“Voya”) is exempt from the requirement to hold an Australian financial services license under the Corporations Act 2001 (Cth) (“Act”) in respect of the financial services it provides in Australia. Voya is regulated by the SEC under U.S. laws, which differ from Australian laws. This document or communication is being provided to you based on your representation that you are a wholesale client (within the meaning of section 761G of the Act), and must not be provided to any other person without the written consent of Voya, which may be withheld in its absolute discretion. This material may not be reproduced in whole or in part in any form whatsoever without the prior written permission of Voya Investment Management. 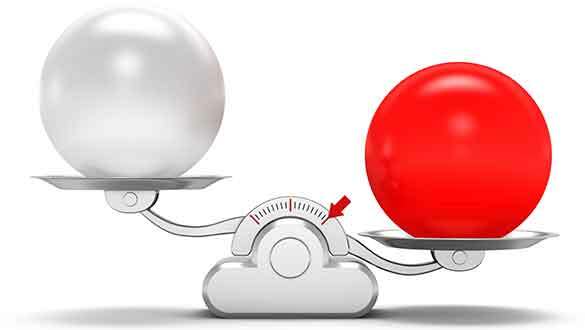 Asset Gatherer versus Asset Manager: What Happens When a Core Bond Strategy Gets too Big?